Some days are really strange, let me tell you a little Jungle Fairy Tale ---> i was cleaning up my colour trunk, removed mostly dead colours and refreshed the trunk with new ammunition - in the end every colour was in place, no space left, everything perfect and ready for the colour blast. There was no Fairy so far. Build a mountain and happy painting! Painting Class Soest, can´t wait for it !!!! They taste better as some others - but more to it soon, when there comes a bigger review :) - Secret Weapon Miniatures Banner now included! Thanks to Secret Weapons for supporting the jungle! 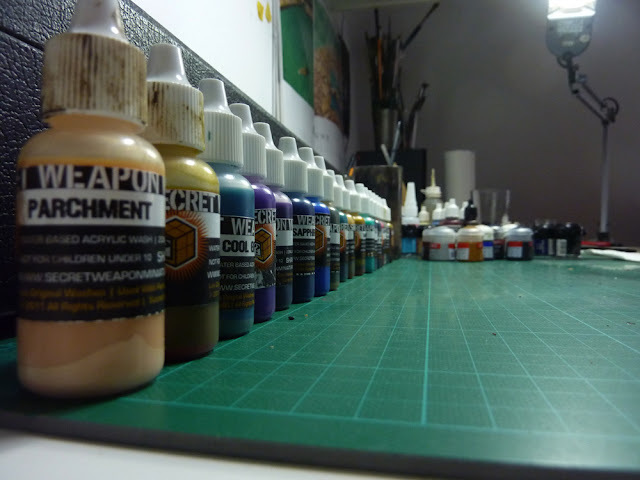 If you´re in the mood for thanking people, you should include Les from Awesomepaintjob, who made the washes in the first place :-). I mixed some Soft and Heavy Body Black Wash and some Armor Wash from his recipes, which are the same as the Secret Weapon ones and they are absolutely brilliant!